Listen to episode 15 of the Better Food Stories interview series, which features Nurture Life cofounder, Jennifer Chow, discussing how Nurture Life is changing the way parents feed their kids, building a brand focused on quality, convenience and nutritious food from the start. Nurture Life provides freshly made, nutritionally balanced meals for babies, toddlers, and kids. Co-founded by Jennifer Chow—who not only has food allergies but is a food allergy mom herself. All meals are created in-house in a facility dedicated free from the allergies she and her son share—peanuts, tree nuts (except coconut) and shellfish. "'For parents that feel guilty if they don't do everything, my response is to seek help,' says Jennifer, who's now a mom of two. Find shortcuts that work for you, whether that's paying for a meal-delivery service, devoting a few hours on Sunday to meal prep, or ordering groceries online to avoid those epic 6 p.m. checkout lines. "We have so much on our plates already," Jennifer says. And saving time without sacrificing good, healthy food is an excellent form of self-care." "Between caring for your bambino and keeping up with the rest of your life, food prep can seem like an added stress. Enter Nurture Life, the first organic food delivery service for babies and kids. Their meals are created by chefs and pediatric dietitians based on the USDA MyPlate guidelines. With Nurture Life, you can feed your little ones a wide variety of produce, proteins, and grains without lifting a finger in the kitchen." "Recipes developed by a chef and pediatric dietician prove to be a huge selling point for consumers, and what is setting the company apart from others. Being that Nurture Life is the first and only subscription meal delivery service focused specifically on children, the founders had to blaze the trail for the ready-to-eat market when it came to business models and benchmarks as a company." Founded by a mom who wanted to give her child fresh, wholesome meals—without sacrificing time together—Nurture Life is a meal delivery service that ships age-specific, dietitian crafted meals to your doorstep. Each recipe prioritizes organic, seasonal produce and never includes artificial flavors or colors, trans fats, or high fructose corn syrup. All you have to provide are your children's ages and dietary preferences to get started. It's a great, simple option for first solids and for expanding the palates of older children—and mamas will love how much time and energy is saves them. When you don't have the time or energy (or ingredients!) to cook a healthy, home-cooked meal, mom guilt levels can shoot through the roof. Nurture Life is an organic meal delivery for babies, toddlers, and kids curated by a culinary team and pediatric dietitian, that serve up children's favorites, incorporating high-quality produce and protein into each meal. After two weeks of using the Nurture Life service, I saw the benefit of the extra help. I enjoyed reading the ingredient list and seeing how many vegetables were in the Vegetable Bolognese sauce (at least seven! ), and taking a quick bite of some of the dishes, I appreciated that they actually tasted yummy. Nurture Life is one of the original players in the meal-kit delivery service for children, and their offerings are the most diverse: you can select meals based on your child's age, and there's options for babies, toddlers, young children, and even preteens. Nurture Life will ship fresh and healthy meals directly to your hotel when you’re on vacation; and also to your residence when you are back home. We love this company for meal delivery because they focus solely on children between the ages of 6 months and 18 years and design their organic, ready-to-eat meals especially with their nutritional needs and tastes in mind. Nurture Life offers a number of different flexible subscription plans, including weekly options. Nuture Life is a delivery subscription box of premade jars of food for babies and meals for toddlers. It offers three different stages of baby meals based on age, starting with simple purees up to finger foods with diced vegetables and fish or meat for 10+ months. They also offer toddler meals for 1–3-year-olds, and kids meals for up to teenagers. Jennifer Chow was inspired to create Nurture Life when she found herself spending evenings prepping her son's meals for the next day. Chow and partner, Steven Minisini, create fresh, organic meals for baby, toddler and kids. Everything is made with seasonal ingredients, local when possible, and void of peanuts, tree nuts, shellfish, artificial ingredients, trans fats or high fructose corn syrup. Menus change weekly. Lunches from Nurture Life, best enjoyed warm from an insulated lunch container, are pegged for different age groups with input from a pediatric dietitian. Teriyaki salmon over brown rice and spinach-stuffed gnocchi with vegetable Bolognese are two popular picks. In addition to being nut-free, all Nurture Life meals are made without shellfish, artificial ingredients, trans fats or high-fructose corn syrup. You can't get much easier than Nurture Life, which delivers meals for kids as young as 6 months old! Select the Chef's Choice menu and they'll even take the guesswork out of starting solids by sending meals that introduce your babe to new foods and textures each week. Food subscription boxes have already simplified meal prep for grown-ups. Now, new companies are serving up similar options for tots. We asked working moms across the country to tell us if the services really deliver. Have kids of many ages? This plan has it all! Yummy, organic, ready-to-eat options for toddlers—mashed yams and French green peas or mac and cheese with cauliflower, and baby foods like butternut squash puree and turkey or garnet yam and Golden Delicious apple puree—add variety to their diet and gave them reaching their chubby fingers for more. Piper-Lori Parker is a busy mom using a meal delivery service—for her baby—to make sure he gets the right start in life. “This is real food. Real vegetables, pureed in a way that I can’t do myself; whole, organic and even local food,” Parker said. Jennifer Chow is co-founder at NurtureLife.com, one of several start-ups helping fill little bellies. “Many families today are very busy and want to feed their kids very well, but don’t necessarily have the time to or the desire to grocery shop, prep, cook, etc.,” Chow said. This parent-founded company provides a subscription service that includes healthy foods for baby to munch on. You give them your child’s age and dietary preferences, and Nurture Life then gives you their Chef’s Choice menu. If that doesn’t work for you (or your baby), pick meals from the seasonal or favorites menus. You’ll get a week’s worth of chilled, but not frozen, meals. All you need to do is warm and serve. To make mealtime a whole lot easier—and healthier—Nurture Life (from $45 to $119 per week) delivers fresh, organic, ready-to-eat meals designed to meet the nutritional needs of kids up to 18 years old. The menu rotates weekly to include seasonal choices to introduce kids to new flavors along with classics you know they’ll love. 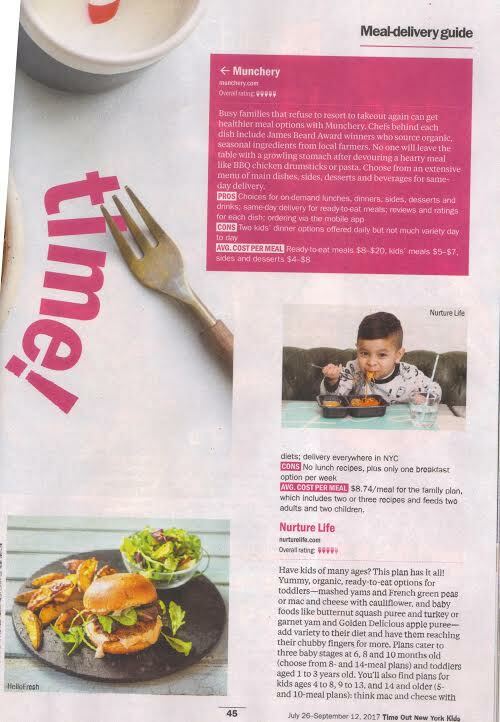 Servicing most of the Midwest and East Coast (with West Coast delivery coming soon), Nurture Life offers ready-to-eat meals shipped fresh (cold, not frozen) for babies starting at six months—and also, toddlers and kids. The toddler foods (packaged to just heat and serve) were legit: he gobbled up a hearty portion of cauliflower mac and cheese (above) in two sittings, and loved the falafel, something I would never think to make him.... Everything was healthy and delicious (I sampled it all) and since you can freeze just about all of their items, you can stretch what they send you for a while. Bon appétit, babies! WGSN stopped by to meet the Nurture Life team and talk about the importance of quality and convenience in delivering nutritious, ready-to-eat baby, toddler and kid meals for today's consumers. The benefit to these services—the growing lineup also includes Little Spoon, a blended baby food line out of San Francisco, and Nurture Life, whose broader kids’ menu ships to the Midwest and the East Coast—isn’t just a matter of convenience for working parents. There’s also the mental load-off in knowing that there’s an ally in the kitchen. Ask any working parent who’s ever fed their toddler fish sticks 3 days in a row and they’re likely to agree: Figuring out what’s for dinner every night ⏤ not to mention, what’s healthy and for dinner ⏤ is a giant pain. It’s why some parents have nanny’s that cook for them. And it’s also what led to the creation of Nurture Life, a new kid-food subscription service. Just yesterday I was chatting with a friend and described my experience of being a parent, and compared it to driving a car when you don’t know how everything in the car works, and you also don’t know where you’re headed. If this resonates with you or anyone you love, Nurture Life will be a welcome addition to the family. Need help on more than one meal per day? Have a little one who isn’t quite ready for solid food yet, but can’t bring yourself to feed her mush from a jar that expires when she’s twelve? Parents want the best for their kids, especially when it comes to nutrition, and entrepreneurs Jennifer Chow and Steven Minisini are no different. Chicago-based company Nurture Life is focusing on delivering healthy, ready-to-eat meals for children from the age of 6 months up until 18 years. Tech industry veterans Steven Minisini and Jennifer Chow had a choice to make when launching Nurture Life, their subscription food delivery startup for kids: remain in Silicon Valley, where they were currently based, or return to Chicago, where Chow was born and Minisini spent several years as the founder of a consulting firm. Local parents Jennifer Chow and Steve Minisini were spending hours a day making homemade food for their baby when they came up with a way to make the process easier for other moms and dads. Nurture Life is an organic meal delivery service for babies and children 4 months and up. Eric Bauer, our vp of culinary operations, shares a few kid-approved recipes that incorporate the vegetables, protein and overall nutrition that growing children need on Fox 32 Chicago. Let’s do some simple math — 3 meals a day times 18 years. That’s almost 20,000 meals to get your mini-you to adulthood. Gulp. So what do you do if you’re too busy to do it day after day, or (in some cases), simply not very good at it? Fortunately, now there’s an answer to those questions and to parents’ prayers. Read on to learn about the two newest meal delivery services specifically designed for kids. Move over all you busy, healthy-eating adults. Babies and kids are getting in on the prepared-meal action, too. Billed as the first and only subscription-meal delivery service focused on babies and kids aged 6 months to 18 years old, Nurture Life was conceived of as a convenient way for parents to help their offspring begin to learn to eat well at a tender age.